With a new device comes new possibilities, and the iPad is full of new ways of working with your music. While it’s much more than just a portable music player, you’ll probably listen to music on your iPad from time to time. To access your music on the iPad, you tap the iPod app. This displays an interface that is closer to that of iTunes than that of a pocket-sized touchscreen device. The left column shows your library: music, podcasts, audiobooks, and any playlists you have synced. When you tap one of those entries, you’ll see its contents to the right. To create a new playlist, tap the plus (+) button below the sidebar. This brings up a box—similar to the one you get when prompted to enter a Wi-Fi password—asking you to name the playlist, as well as an on-screen keyboard to type it. Enter a name, then tap Save. The playlist displays briefly in the sidebar, then a list of all your songs pops up. Each song has a blue plus (+) icon to the right; to add a song to the playlist, just tap on the icon next to its name. This song list is limited, though; it only shows the song name and artist, so if you have more than one version of a song, you won’t know which album it comes from. There’s also a Sources button right under the volume slider in the upper-left corner—use it to pick from music, podcasts, audiobooks, or any other playlists to build a new playlist. Creating a playlist by drilling down into an artist page. You can view your music in other ways, however, to add songs to the playlist (the Sources button serves the same function with them all). At the bottom of the song list are buttons labeled Songs, Artists, Albums, Genres, and Composers. Tap one of these to see your music sorted in different ways. If you tap Artists, you’ll see each artist’s name with a single album cover in front of it (assuming all your music has album art). Tap an artist name and you’ll see all the songs you have by that artist, sorted by album and then song on the right, with album art on the left. Tapping Albums displays all of your albums as cover art graphics, similar to iTunes’ Grid view. Tap an album image to get a pop-up of its contents; tap a song to add it to the playlist. Tap outside the pop-up window to make it go away, and tap another album to see its contents. The pop-up window lets you choose songs from an album. Tap Genres and you’ll get a Grid view display of your genres. Tap one and you see a pretty useless pop-up of all the songs or tracks in that genre, without any artist or album information to help you figure out what’s what. Finally, if you tap Composers, you get a display similar to that of Artists: one line for each composer, with a name and album cover. Whichever method you use to find your music, just add all the songs you want, then tap the blue Done button, at the top-right of the window, when you’re finished. One of the biggest differences with the iPad’s playlist feature is what you can do after you’ve made a playlist. Choose it by tapping it in the sidebar, then, if you don’t like the way you’ve set it up, you can make changes. Tap the Edit button, then if you want to change the order of the songs, tap and hold the three-line icon at the right of a song, and drag it where you want. If you want to delete a song, just tap the red minus (-) icon, then the Delete button that appears to right. And if you want to add songs, tap the Add Songs button next to Done and throw another few songs or albums in the mix. When you’ve finished, tap Done. Want to make a new playlist? Tap the plus icon again and start the process again—you can create as many playlists as you want. Tired of your playlist? Tap Edit, then tap the red icon to the left of the playlist’s name, then Delete. 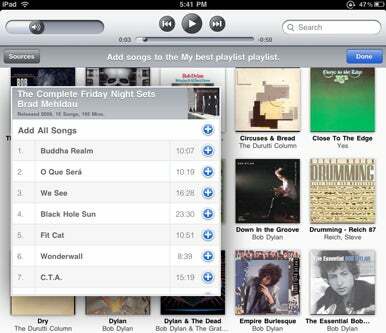 You may even find that making playlists on an iPad is easier or more convenient than on your Mac. Since any playlists you create on the iPad sync to your Mac the next time you connect the iPad, you can use this method to set up playlists you plan to make use of on your computer as well. There are a few shortcomings with playlist creation on the iPad, however. You can’t easily create playlists using TV shows, movies, or music videos, which are confined to the Videos app (that is, unless you’ve created a playlist on your computer to sync with the iPad that contains videos—and even then, the iPad treats them as songs). You also can’t create smart playlists. At least not yet.